Helps maintain strong natural defences thanks to antioxidants, such as vitamin E. Maintains a healthy urinary system by helping to reduce the concentration of the minerals which can lead to urinary stones. With high quality ocean fish for protein and great taste. No added artificial colourants, preservatives and flavourings. Purina ONE® Adult Mini Fillets in Gravy - contains: 10x mini fillets in gravy with lamb and carrots, 10x mini fillets in gravy with chicken and carrots, 10x mini fillets in gravy with ocean fish and green beans and 10x mini fillets in gravy with beef and carrots Discover PURINA ONE wet meals with high quality ingredients, specially formulated by Purina vets & nutritionists to combine high quality nutrition with great taste. Rich in vitamins and minerals, these complete and balanced recipes of tender mini fillets and vegetables in a delicious gravy, provide targeted nutrition. 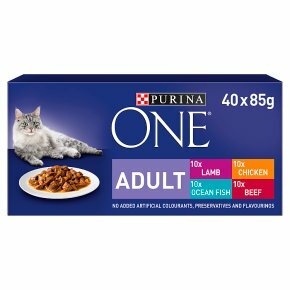 With PURINA ONE, you can be sure you are giving her all she needs to help stay healthy today and tomorrow. For an average cat of 4 kg, feed 3 to 4 pouches per day in at least 2 separate meals. The recommended daily amounts should be adjusted to weather conditions, cat's level of activity and its physical condition. Serve at room temperature. Clean, fresh water should always be available. Alternatively feed 2 pouches combined with 30g kibbles of Purina® ONE® adult per day.